You know a recipe is a good one when half the ingredients are vegetables! A diet with lots vegetables can help us reach a healthy weight and maintain it. These foods are also great a source of many vitamins and minerals that our body needs such as Vitamin A, K, C, potassium, and zinc. Adult women and men should be consuming around 2-3 cups of veggies every day. 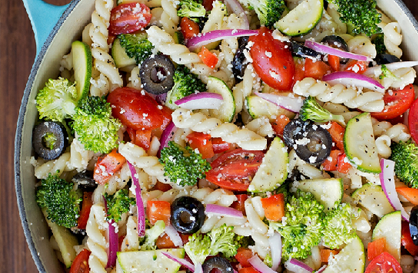 Keep in mind for this recipe you can try using whole wheat pasta and a “lite” Italian dressing to help cut calories and provide better glycemic control for diabetics. 1. Place a large pot of water over high heat, bring to a boil. Add the pasta and cook according to the package’s directions. Drain and set aside. 2. Meanwhile, prep the veggies, then in a medium bowl, whisk together the dressing, parmesan, parsley, garlic powder, paprika, salt and black pepper. 3. In the large pot, combine the pasta, veggies, and dressing. Stir until combined. Serve immediately or cover and refrigerate until ready to serve. Liz Quinn, RD, has joined the bariatric program and will provide the outpatient nutrition counseling and guidance that are integral to the success of health behavior changes in the Optifast and bariatric surgical tracks. Additionally, Liz provides medical nutrition counseling (MNT) for weight management.